after working through a significant amount of wrecking crew, i had some NES momentum and was finally able to start and complete a game that’s been hanging over my head for ages, namely zelda ii: the adventure of link (on the original NES no less, meaning no save states!). the game is easily the blackest of the black sheep of the zelda series, and it was partly the fear of old-school NES challenges that kept me from starting in on it. (for a run-down of the game, see check out the review at nintendolife). overall, though, the game wasn’t too hard to complete, with the main exception being the last temple which required a concerted effort to get through, and multiple attempts to beat (esp. since i was missing a heart container and a couple of the last level-ups). [pro tip! to save at any time, press start on the first controller, and up + A on the second controller. also, fortunately at the final temple getting a game over and continuing simply returns you to the start of that temple rather than the starting point of the game.] the game was one of the many games i remember playing as a kid, although i don’t recall if i ever actually beat it. i certainly recognized some of the areas near the end, but i didn’t remember anything about the final temple which makes me think i hadn’t beaten it. perhaps my muscle memory from childhood remembered more than my brain did, because i got through the game pretty efficiently without any guides, although it was pretty much just a stroke of luck that i stumbled across one of the essential items that i had wandered by several times before, the absence of which would have led to a lot of aimless wandering, wondering where to go next. as for the game itself, i enjoyed it and it’s definitely a polished experience, although it pales in comparison to most of the rest of the series. miyamoto himself has expressed some regret about the game, and although the game is definitely not a “bad” game, it does feel a little limited in its scope. the focus on platforming (and some cheap deaths that result) feels a bit out of place, and the battle scenes and temples tend to feel very same-y, not to mention its inclusion of a range of bizarre characters that, rather like super mario bros. 2, have yet to see a return. 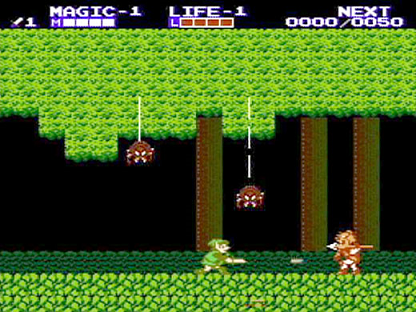 i have a vague recollection that the battle of olympus, which appeared on the NES about a year later and which i also had played as a kid, borrowed much of the same mechanics but improved upon them, so i’ll have to dig that one out at some point. all in all, a nice change of pace from the norm, and it would be fascinating to see nintendo revisit this unique take on the zelda series. regardless of the quality of the game itself, though, i’m just uber-psyched that i’ve now finally officially completed every zelda game, and in almost all cases on the original hardware. whoo! i should be putting together my ranking of the series before too long, so stay tuned. i’m also looking forward to replaying various entries, mostly via their remakes, including the 3DS remake of ocarina which i’ve already dipped into. – someone made a FPS adaptation (of the first part at least) in unity. here’s a video of someone playing through it. – since i’ve finished all the official zelda games, i thought now would be a good time to take a look at the atrocities that are the trio of obscure CD-i games. here’s a let’s play video of wand of gamelon and here’s one for zelda’s adventure. fortunately the completionist in me feels no need to pick any of them up.